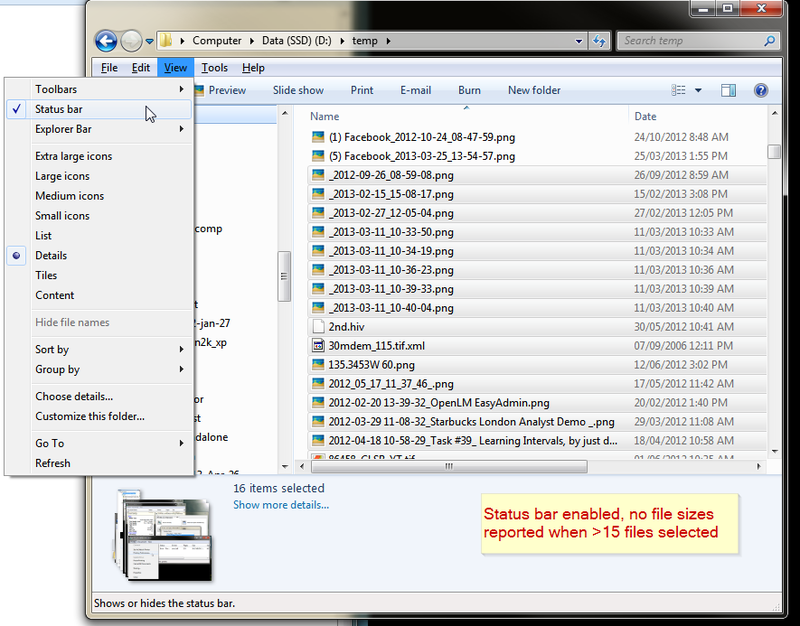 Windows 7 Explorer: how to show total size of all files in current folder? In Windows XP Explorer one can turn on Status Bar which shows, among other things, the total size of all the files in the current folder, or if the cumulative size of the selected files. How do I get the same at-a-glance information in Windows 7? Selecting files doesn't count as it stops after 15 files, and it's rare that I'm concerned about total size with that few files (it's pretty easy to estimate in my head). UPDATE: Information derived from the context menu (select > r-click > properties) isn't "at a glance", and not as smooth as selecting files and clicking the details link at the bottom in any case. Thank you for fleshing out more of the available routes though. Yes Q19232 is similar to this one, though it is not a duplicate. That question is about looking for easy free-space on disk stats and this one is easy used-space by contents of this folder stats. The answer for both is the same though. You can't! Hopefully someone will figure how to get this lost feature back with a shell extension or something. If you navigate up one level, and right-click and select "Properties..." of the folder, it will tell you the total file size of the folder. You can also right click the background of the folder (not on a file) when you are browsing it and do the same thing. However, this will also include the size of all subfolders. Right-clicking and selecting Properties displays the total size of whatever files and folders you have selected. If you right-click the "background" of the folder window, Properties gives you the total size of the folder, including any subfolders. It looks like this behavior will return in Windows 8, with a limit of 99 selected files. I haven't seen this mentioned but I highly recommend JdiskReport. It is a small Java app that actually gives you a disk space report that includes all sub folder for the selected drive or folder but then allows you to drill down into individual folders. It reports the size of each subfolder and of "Files in this Directory". I have nothing to do with this program other than being a long time happy user. Folder Size Explorer is a simple and free Windows Explorer clone with the added ability to calculate folder sizes. Go to Organize, then in Layout menu check Menu bar. go to View in the menu bar, you can check the option of Status bar. I find TreeSize works really well for this. I have TreeSize Professional on my machine, but there is also a freeware version. This allows you to very quickly select a bunch of files that must be constraint to some size. Hold CTRL and ALT together and select the items you want. As ALT is hold, you can double click or press enter on one of the items to access the properties. Repeat the last two steps and release the keys when you are done selecting. Not the answer you're looking for? Browse other questions tagged windows-7 windows-explorer or ask your own question. How to display total filesize of selected files in Windows 7? Is there a way for Windows 7 to show remaining disk space in the status bar? How can I make all Windows 7 folders show in the same view mode? How do you prevent the current user folder from opening when starting Windows Explorer? How to show ALL files in Windows 7 Explorer? Can I make Windows Explorer to match *any part* of file or folder name when typing (like Total Commander's Quick Search)? Can I set the Windows 7 Explorer default columns for all folders? How to display the size for folder in windows explorer? How to create certain approval sheet? We have fuel injection, why not air injection? Is rank of submatrix less than or equal to rank of matrix? Is it normal/acceptable to write down notes, thoughts, algorithms, decisions during coding and maintenance? What is so bad with goto when it's used for these obvious and relevant cases? What areas of mathematical statistics are highly employable? Calculate the value of logarithm expression. Why are quotes necessary for files argument when calling this Bash script? Are redundant close buttons on an auto-closing popup necessary? Why was Luke surprised that Obi-Wan had fought in the Clone Wars? Change the time when picking a date? Better way to swap elements in list? Short story about an alien sailor on super high-gravity world finding the wreckage of a terran starship? Kaijuu-like monsters killing humans: What is their viable reason to do so? Why might dwarves be black skinned in a medieval fantasy world? Can a human being live with a continuous stream of blood instead of pulses?